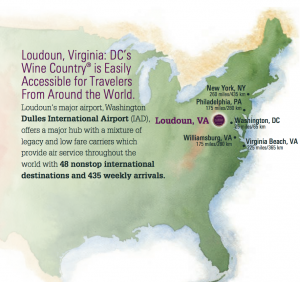 The 2015 Wine Tourism Conference heads to Loudoun County, VA this November 18-20. The Virginia wine industry is buzzing with energy and enthusiasm for the culture of wine and we very much look forward to being in “DC’s Wine Country” this Fall for the annual forum of all things wine + tourism. An opportunity to learn from wine tourism practices from outside the U.S. I would like to know if this conference would be of benefit to me. I have worked in the wine industry (directly & indirectly) for 23 years and I currently head up Marketing at South Africa’s oldest Wine estate (Groot Constantia) and as we get in excess of 350 000 visitors per year, I am always looking to learn from what others are doing, internationally. I am also a Director on the board of Cape Town Tourism and a Judge of South African Tourism’s Lilizela tourism awards. As our current exchange rate makes any trip to the USA very costly, I would like to approach our Department of tourism for assistance with funding but first need to establish whether I would be able to extract value by attending. Please also let me know if I could somehow contribute to your conference by sharing our experiences in South Africa. Grant, this conference should be of benefit to you. The goal of the conference is to provide concrete information attendees can take home with them to improve their own wine tourism offerings. Most attendees do take plenty of notes with lots of ideas. The learning happens both from the scheduled sessions and from meeting other participants. Come join us!